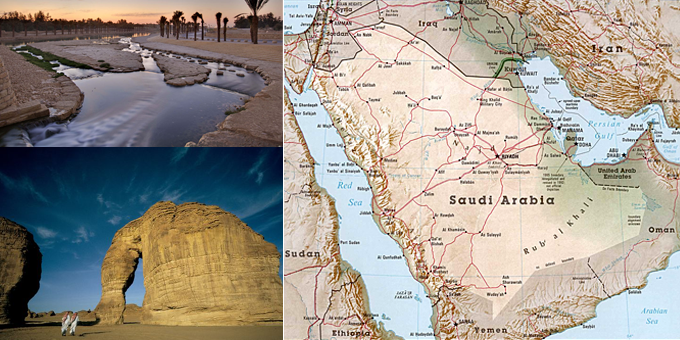 Kingdom of Saudi Arabia, is the largest Arab state in Western Asia by land area (approximately 2,150,000 km2 (830,000 mi2), constituting the bulk of the Arabian Peninsula) and the second-largest in the Arab world (after Algeria). It is bordered by Jordan and Iraq to the north, Kuwait to the northeast, Qatar, Bahrain and the United Arab Emirates to the east, Oman to the southeast, Yemen in the south, the Red Sea to the west and Persian Gulf to the east. And has an estimated population of about 16 million citizens. The Kingdom of Saudi Arabia was founded by Abdul-Aziz bin Saud in 1932. Saudi Arabia is sometimes called "the Land of the Two Holy Mosques" in reference to Al-Masjid al-Haram (in Mecca), and Al-Masjid al-Nabawi (in Medina), the two holiest places in Islam. Saudi Arabia has the world's 2nd largest oil reserves, which are concentrated largely in the Eastern Province. Oil accounts for more than 95% of exports and 70% of government revenue, although the share of the non-oil economy has been growing recently. It has also the world's sixth largest natural gas reserves.